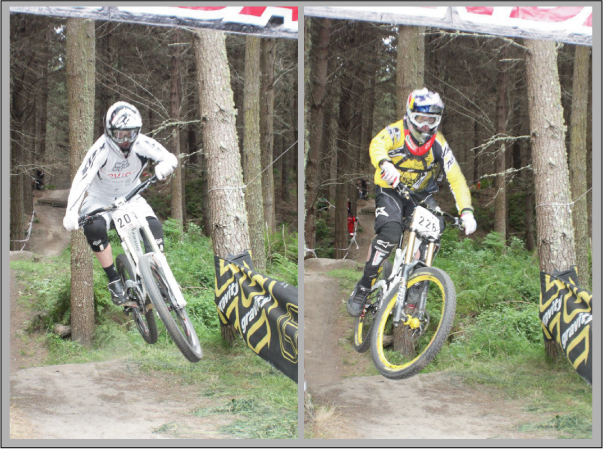 The 3rd round of New Zealand’s Downhill Championship Series took place at Napier’s Eskdale Forest over the weekend. The popular High Roller track was used and local International Red Bull rider Brook Macdonald was well impressed with the new layout. Saturday morning competitor registration was outstanding with 136 registered riders for the weekend. Great Spectator turnout at NZDH Round 3 – Hawkes Bay. The sun was out in typical Hawkes Bay fashion, a cold wind and dry dusty conditions provided a perfect day of practice runs for all riders. Great to see the participation of all the local returned International riders over the weekend with the highlight of the Pro Elite riders, Brook MacDonald and George Brannigan mixing it up with the home based riders in preparation for tomorrow’s race day. The younger riders thought it was all pretty cool being in presence with these World Cup riders they read about competing at World Cup Events overseas. Morning Race day weather conditions were outstanding once again. The morning practice went without a hitch and racing started right on time at 12.00nioon. This weekend had four riders competing in the Hardtail class with Antony Gunter taking out the top spot for his efforts. The women’s class consisted of 3 riders, good to see Kaytee Campbell starting to show signs of her original speed in her race runs again to take the top podium spot. Masters men class was a bit of a turn around this weekend with series leader Cambell Wilson having to settle for 3rd place after Liam Oryan and Simon Fugle managing to get on top of Cambells pace through the race runs. The U15 class was full of action this weekend with 13 competitors and it was great to see Hayden Meles finally taking a well deserved 1st place for the weekend with series 1st equal leader Jack Humphries taking 2nd spot. U17’s being the largest field of the day with approx 40 riders competing, once again Lawrence Cawte dominated the 1st race run by 3secs, but it was soon discovered that danger was lurking in the background when local rider Nick Roydhouse took out the top podium spot on his 2nd run by the slimmest of margins! The under 19 class was also full of action with the presence of local World Junior Champs competitor Jay Barrett competing with his previous racing foe Louis Hamilton with Louis managing to take out the win, it was a shame to see Jake Robinson being taken out of his 2nd race run with a nasty crash, but in usual Jake Robinson style, Jake managed to pick himself up and walk back to the finish line with a little assistance! Senior Mens had a good level of competition at the top end with Jonathan Andrews taking 1st place with Carl Edmonson narrowly slotting in for 2nd with Phil Marfell coming in for 3rd overall. Matt was the only Pro Elite competitor that managed to stay within touch with Brook and George of which George Brannigan took out the top spot with Brook close behind and Matt coming in for a fine effort 3rd placing. Overall, it was an awesome weekend of competition and fun with a good amount of spectators coming to the venue to witness some great racing. The new NZDH series is starting to warm up and the interest is mounting for Round 4 in Taupo in 2 weeks time. The NZDH round 4 is the 1st event of the Taupo Bike Festival week of which is being well received from the organizers. We are all looking forward to NZDH Round 4 in Taupo on the 19/20th November 2011. This entry was posted on Wednesday, November 9th, 2011 at 6:30 am and is filed under Uncategorized. You can follow any responses to this entry through the RSS 2.0 feed. Both comments and pings are currently closed.